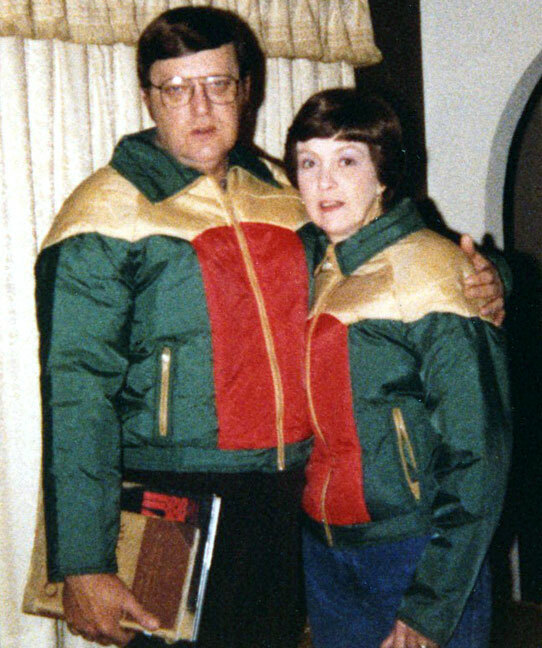 Joe and Sarah Jo bought matching ski jackets. Why? What equipment is used to play Horse Hockey? Who broke the red vase? Who got blamed? What restaurant did the Barron’s church resemble? The game Sorry was the second-favorite toy in grandma Barron’s closet. What was first? Describe the fiery aircraft crash in the Barron’s back yard. Who put jelly on the windows of the Cadillac and why? Who put tighty whities on the dog and why? What did Joe make for Richard’s wife Abby, that no one was allowed to have until Abby had all she wanted? What was Joe’s solution to our need for a backyard picnic table? What is the mysterious substance in the grey jar in the shadow box? This looks like a jar of grey paint. What is really in it? What didn’t Joe and Sarah Jo do on their ski trip to Taos? What did Grandma Barron use to clean the stove on at least one occasion? On what was Richard reluctant to sit during our 1975 California vacation? On whom did Richard have a crush on that vacation? 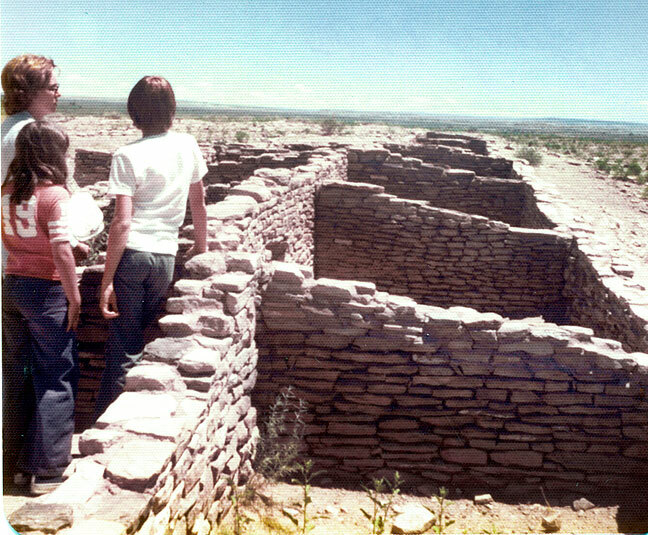 The Barrons visit ruins on their California vacation in 1975. 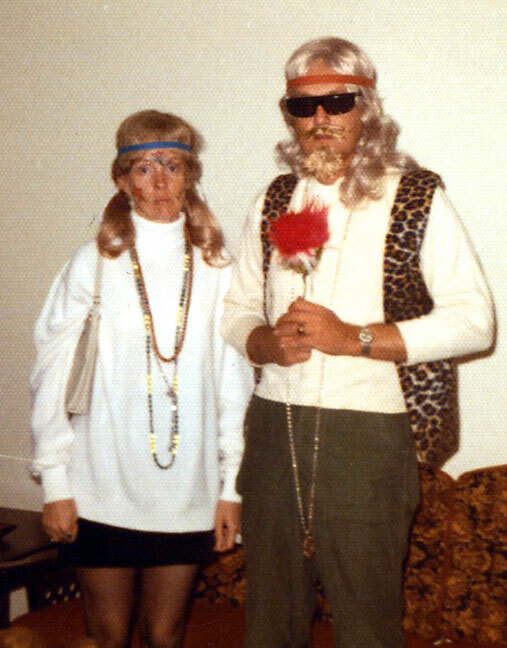 Joe and Sarah Jo weren’t really hippies; it was Halloween 1972. What did Sarah Jo say when particularly excited? What happened to Lori during the Wichita Mountains picnic? What was the driving tester’s excited utterance during Nicole’s first licensing examination? What was Sarah Jo’s signature facial expression for photographs? What is “American” spaghetti? What is dog pie? What is cow in a blanket? 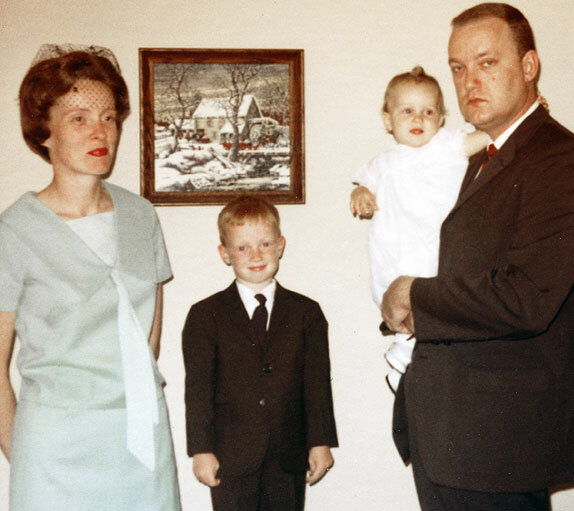 The happy clan poses for a photograph in late 1967 or early 1968. What was the name of Richard’s first car? And of Nicole’s? For several Christmases, Nicole asked for a wig so that her hair would resemble which celebrity’s? On whose lap did Joe vow to sit during that performer’s show? 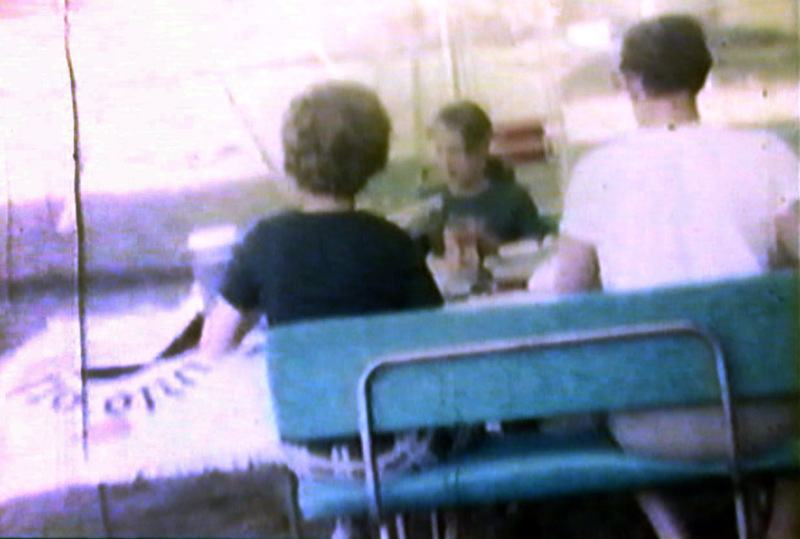 This blurry frame grab from an 8mm transferred to VHS video cassette transferred to DVD contains a treasure trove of Barron family insights. Equally entertaining now would be to post all the answers in no particular order and let people match them to the questions. I’ve been in your family for four decades and I don’t think that I’d have any money left over for final Barron jeopardy with those clues. OK, I know the answers to some of these (You said “green bean pie” when it was actually rhubarb), but what the heck happened to me on a picnic in the Wichita Mountains? Did it have something to do with a buffalo chip, because that’s all I remember – mountains of buffalo chips! What equipment is used to play Horse Hockey? I don’t actually know this one, but my guess is…Brooms and Tin Cans? What are Crummards? A divine mixture whose primary ingredient was an ancient bottle of Old Spice aftershave. I believe its “bite” came from those ubiquitous seed pods that scattered all over grandma’s backyard. Its purpose? No idea. Who broke the red vase? Who got blamed? Richard. Richard. What restaurant did the Barron’s church resemble? Taco Bell. It isn’t even a church any more, which says something about its un-church-like appearance. The game Sorry was the second-favorite toy in grandma Barron’s closet. What was first? An empty, brown-and-yellow bottle of Bufferin. There was also a beautiful blonde doll with which I wasn’t allowed to play, for reasons that were never clear to me. Describe the fiery aircraft crash in the Barron’s back yard. Richard and his friend (Keith? Michael?) got up onto the roof at the house on Arrowhead and light model airplanes afire. It was Nicole’s job to stand below, with a hose, to extinguish them whilst wailing, “Oh, the humanity!”. Who put jelly on the windows of the Cadillac and why? I don’t know, and will never know, because unless it was Daddy, the person who did this is now dead. Who put tighty whities on the dog and why? Daddy did. (sotto voce…she had her period). Why would you say, “Hick, hernia!” It’s quite helpful when attempting to lift something heavy. What did Joe make for Richard’s wife Abby, that no one was allowed to have until Abby had all she wanted? Not sure about this one. His specialties were all very good. Pineapple upside down cake? Key lime pie? Chili? White beans with a big ham hock in ‘em? Cold potato soup? What was Joe’s solution to our need for a backyard picnic table? A turquoise faux leather restaurant booth. Some things you can’t make up. What do you get when you call, “Fallout!” Wow, really at a loss on this one. I got nuthin’. 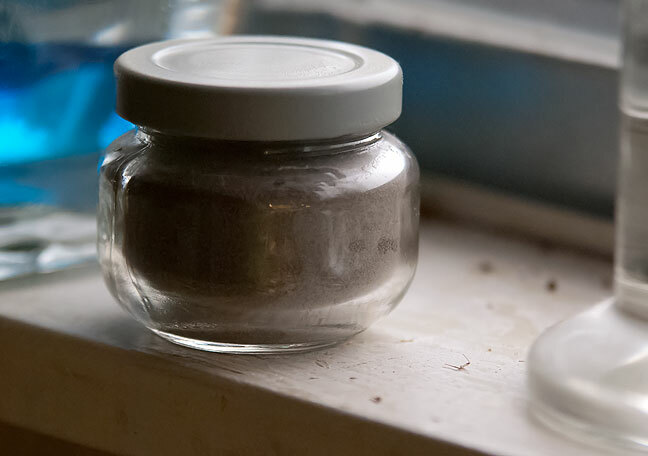 What is the mysterious substance in the grey jar in the shadow box? Ashes from the Mount St. Helen’s eruption, collected while Mother and Daddy were in Alaska. What didn’t Joe and Sarah Jo do on their ski trip to Taos? Ski. But they bought jackets! What did Grandma Barron use to clean the stove on at least one occasion? A round sausage pattie. Completely understandable. The sort of thing that could happen to anyone. What is baloney salad? Bologna, hard-boiled eggs, sweet pickle, and mayo, ground together in an ancient iron meat grinder. I don’t like bologna, but it was kind of good, as was the roast beef salad Daddy would make, which came from leftover pot roast meat and also featured sweet pickle and mayo. You know, I haven’t eaten a sweet pickle since I left home at 17. I miss those. On what was Richard reluctant to sit during our 1975 California vacation? On whom did Richard have a crush on that vacation? A petrified (actually petrified – not, you know, frightened) log. He had a crush on our cousin Valerie, is my guess. Hell, *I* had a crush on her. Still do! What did Sarah Jo say when particularly excited? RING-O-DING, accompanied by a gesture unique to her – hands waist-level, palms outward, waved in a circular motion, in opposing directions. What happened to Lori during the Wichita Mountains picnic? A bird crapped onto her hand, specifically in that webbed area between the thumb and forefinger. She said, “Oh, great”, and in doing so modeled perfectly the tone and timbre of an exasperated teenager. What was the driving tester’s excited utterance during Nicole’s first licensing examination? “Hit the grass! Hit the grass!”. I’d driven the wrong way down a divided highway. Again, completely understandable. Sort of thing that could happen to anyone. What was Sarah Jo’s signature facial expression for photographs? Wide, bright eyes, lips slightly parted, as if poised to say a delighted “hello”. What is “American” spaghetti? What is dog pie? What is cow in a blanket? American spaghetti, a dish my husband rarely allows me to make, consists of ground meat browned with onion, into which is mixed 2 cans of Chef Boy-R-Dee (or Franco-American) spaghetti, then topped with 4-6 slices of American (hence the name) cheese, which is allowed to melt until it’s all blended. Mmmm. Want. Dog pie is a tin of crescent rolls, spread and flattened onto a cookie sheet, down the middle of which is spooned a sloppy-joe-type mixture which is then topped with shredded cheese. The dough is then carefully pulled around its filling, pinched shut, and baked for about 45 minutes. Sliced lengthwise and served with a side of green beans, it’s a real treat. Try it! Cow in a blanket is the same as Dog Pie. We had trouble agreeing what to call it. Who said, “I am smiling!” Daddy. Every.Single.Time.He.Was.Being.Photographed. What was the name of Richard’s first car? And of Nicole’s? Cutty Sark (a cool name) and The Brown Bomber (a stupid name; someone else came up with that one). Who exclaimed, “Green bean pie!” I don’t remember this, but I suspect it was Richard, showing his early veganism. For several Christmases, Nicole asked for a wig so that her hair would resemble which celebrity’s? Cher. I wanted it long, dark, and straight. I wanted the opposite of my own hair. I did get a wig that Christmas, but it was short and curly. Mother thought long hair was…I don’t know. Trashy? On whose lap did Joe vow to sit during that performer’s show? Karen Carpenter. Hers was virtually the only popular music he enjoyed. Horse Hockey: played with two brooms and an inverted Parkay margarine dish. I broke the red vase, but we blamed it on Ladybug. Dad put a gelatinous goo on the windows of the Cadillac because they squeaked going down the road. It never worked, and he never stopped applying it. To this day, Abby tells the story of Dad’s key lime pie made just for her. Fallout: the fries at the bottom of the take-out bag. I’m proud to say that I make Daddy’s key lime pie for pretty much every holiday. It’s easy to decorate the top to fit the occasion. They didn’t do nothing. They walked around, they sat by the fire in the lodge, and I’m pretty such Mother rode the lift once. Sadly, I have no memory of driving the Cadillac around.